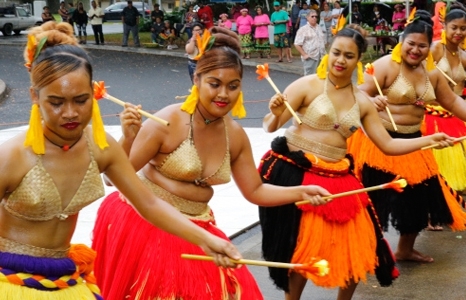 Palau dancers at the 2015 Celebrate Micronesia Festival. In an effort to reach out to one of its neighbor communities the Honolulu Museum of Art launched its annual Celebrate Micronesia Festival in March 2014. In 2015, the festival almost doubled in size and scope. This year guests can expect an even bigger activity-filled family day showcasing the traditional music, dance, crafts, and fashions of the many island cultures that make up Micronesia. Groups such as the Marshallese Women’s Club, and its offshoot dance group Lale Dron, the Chuukese Boys & Girls Group, and the Palauan Ngelekel Belau Student Organization will offer performances, booths showing off traditional arts, and fashion shows. On view in the Art School is Arc: Charting the Path of Celestial Bodies (Feb. 24-March 19). For more Micronesia-related art: Head to the museum to see A Traveler's Impression of Asia: The Woodblock Prints of Paul Jacoulet, which features prints the French artist made of his travels through the region, especially of Yap.